Thanks for the info! 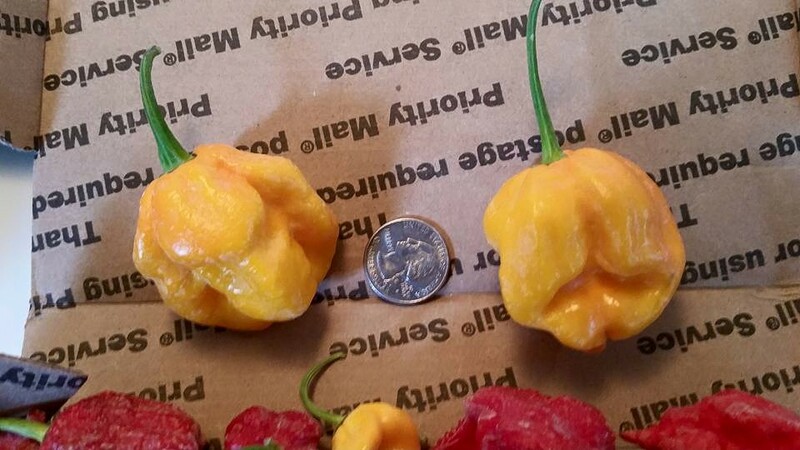 That Peach Ghost Scorpion about melted my face off... lol. Still trying to figure out the rest if you get any time to weigh in... having so much fun with this - thanks again! Purchased another box of fantastic pods from Wicked Mike last week, they arrived in 2 days. excellent selection, fast and friendly service, & just look at these pods! What's more to say, Wicked Mike Rocks!! Got my pods I ordered form wicked Mike today & just wanted to say thank you wicked mike for the great selection of pods . I highly recommend him he absolutely rocks! Ordered on Thursday afternoon got on Saturday.... excellent service, high quality. Wicked Mike does rock!received sfrb from him and had a BrAiN sTrAiN red and it had me seriously regretting my decision to eat it.Milk did not help one bit!!!! Two boxes of pure win from Wicked Mike! 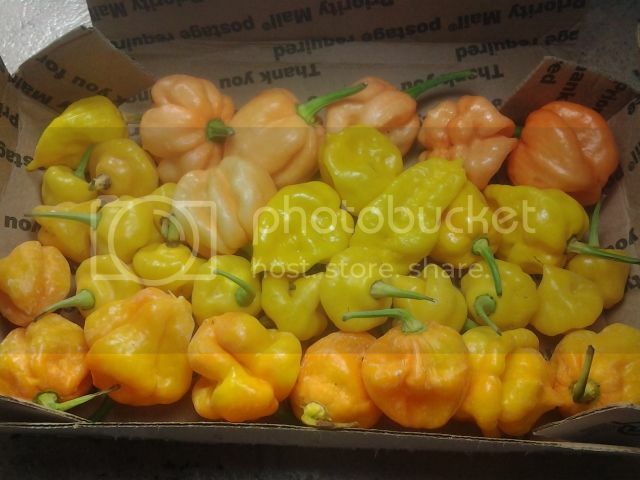 Huge selection of high quality peppers, fair pricing, and friendly customer service. I highly recommend him to anyone looking for fresh pods! 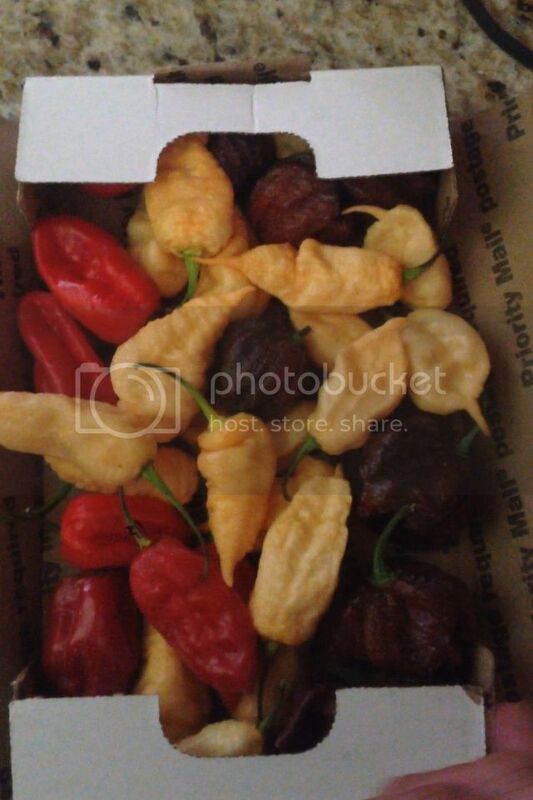 definitely going to have to try those Peach Scorpions next.. they look awesome. If you're talking. 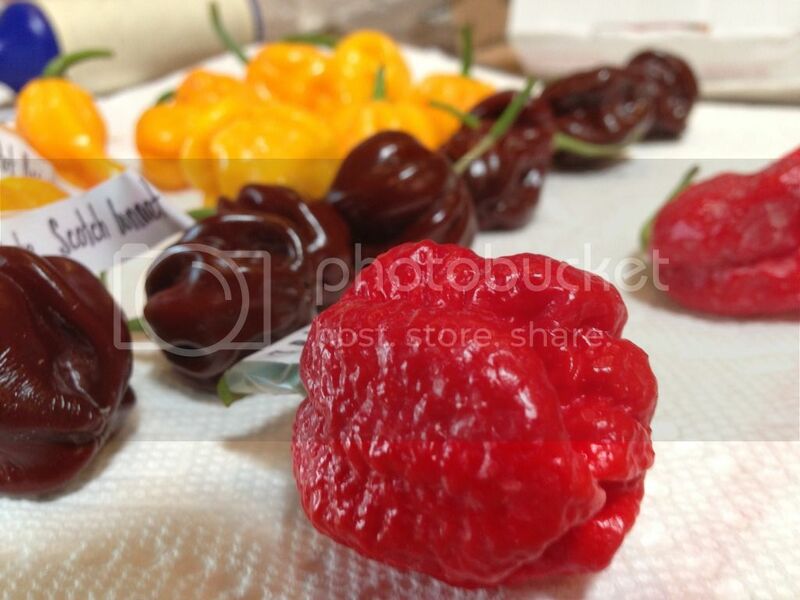 About the one sin the top right corner, I believe those are JPGS ( Jays Peach Ghost Scorpion ). And they are off the chain!! I have some fermenting right now.Speaking of, I should process them soon. Mike is the man and looking at all those pics Seems like they shouldn't be eaten they&look so good!!! Very fast shipping, good service, and very helpful in picking out what to get. Easy and awesome! Thanks Mike! Edited by 1tom2go, 08 July 2015 - 09:48 PM. What the heck. How do you order pods where is his listing? My order from Mike arrived today, 2 days after I placed the order. Beautiful pods! Couldn't be happier with every aspect of the transaction! Been a lurker here for several years. Love this site – feel like I actually know a lot of you. But alas, I am simply a common stalker – until today. It’s a pleasure to have my first post be recognition for Wicked Mike. At the risk of being redundant and/or stating the obvious, Wicked Mike knows how to take care of people. In response to his classified ad, I sent him $18 via PayPal requesting a Nuclear Sample Box. Two days later I’m staring at a SFRB stuffed absolutely full of some of the most beautiful produce I have ever seen. 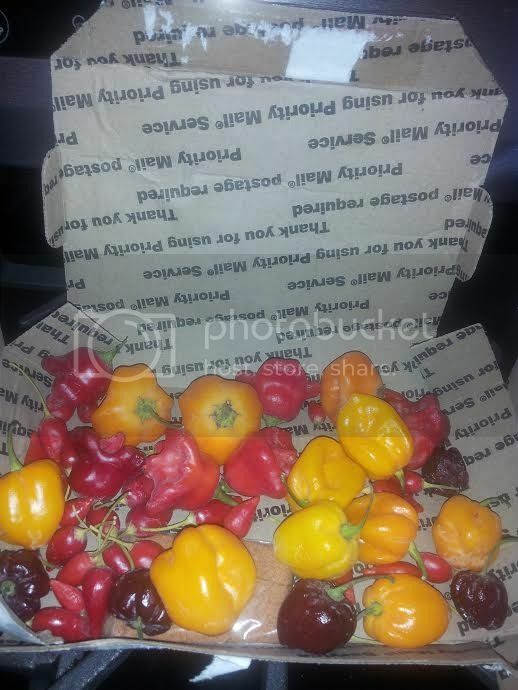 Clearly freshly picked, packed with care (and love? 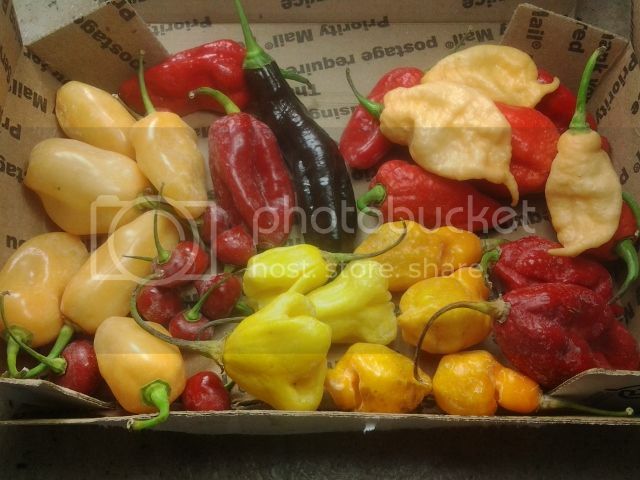 ), with a large variety, it is the best bunch of peppers I have ever seen. I am not really a Chilehead: I dig the heat, but can only handle super-hots in very small doses. Historically, I haven’t really been able to identify flavor differences between super-hots – all I could really taste was pure heat and pain, which is, of course, what I was after. This box is different. 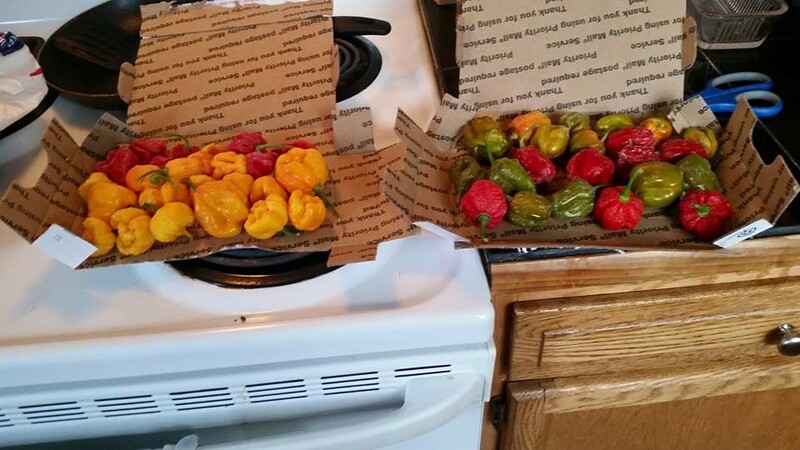 I immediately started sampling the peppers and could tell a distinct difference in taste. They are ridiculously hot - no doubt - but I could actually taste them and they were delicious. I have since cooked with a few, and I simply can’t get enough. Perhaps this will be the box that turns me into a true Chilehead? I wish I had taken pictures before I sealed them up and put them in the freezer – I think I was just too anxious to try to capture as much of the freshness as possible. In the meantime, I think I’m going to order some of the mild/medium varieties Wicked Mike described in one of the messages we exchanged. He is a very friendly and clever guy. His success is not shocking, and I completely agree with all of the praise that has been showered upon him. He is well-deserving of all of it, and I look forward to being a long-term customer. Frankly, all of you are quite inspiring, and I could see myself buying/trading/discussing this stuff with you and Wicked Mike for decades to come. To all of you noob/rookies/lurkers out there (as well as any other interested parties), don’t hesitate to send some money to Wicked Mike. He will take care of you – you may even get a little surprise you weren’t expecting. Honestly, I get the impression he accepts the money as a formality and would prefer to just share his pepper-wealth with all of us and think of us smiling (or crying) because of his generosity.